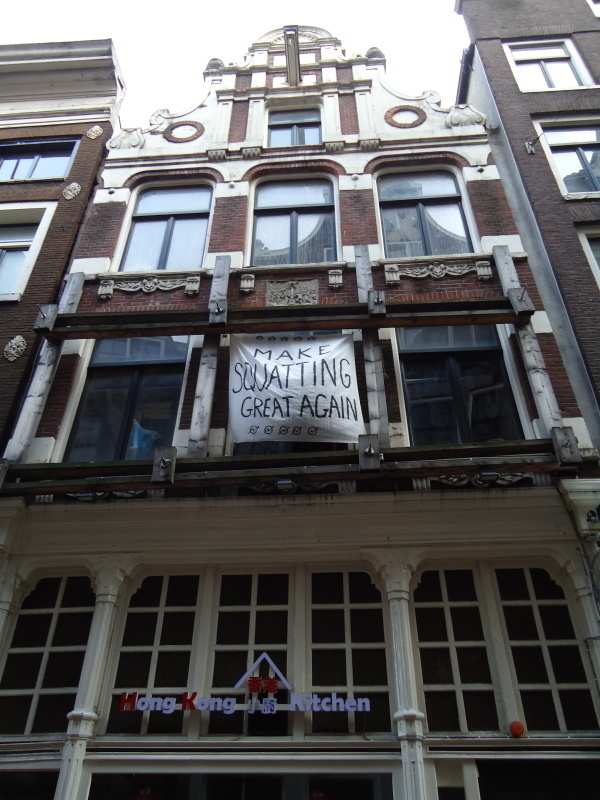 Amsterdam: squatters celebrate christmas by squatting a house! 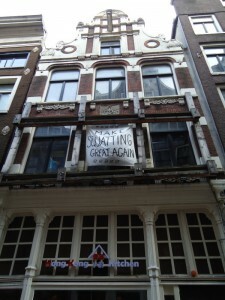 The building, Weteringschans 209, is owned by associates of well know speculators Libra B.V. who are currently also trying to evict the ADM.
We wish everyone happy holidays, and solidarity with all squats and squatters worldwide! Amsterdam, 24 december 2016 – Today, we, a Swahili subgroup of the refugee action collective We Are Here, squatted a building on the Amstelstraat 29-31. 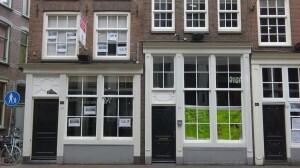 We had no other option because we were evicted from our previous location at the Rijswijkstraat. We have asked the municipality many times to help us with sattisfying our basic needs, such as a simple proper shelter for day and night, but nothing has happened so far. Therefore we have to continue to squat buildings. 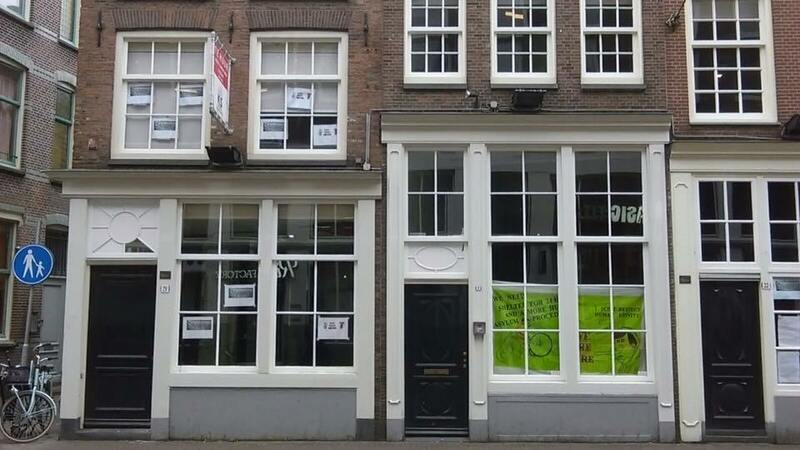 The We Are Here group asks for support at Hoogte Kadijk 401 where they have a sit-in / sleep-in in front of a building that is owned by the governement and where a few anti-squatters live. The police stated that they will tolerate the action till 9 pm tonight. Warm drinks, warm food en warm blankets are very welcome! We are here, we are refugees & we need a solution. We can imagine that you’re worried about this, probably because of the bad reputation squatters have. We have absolutely no plan to make this house into a den of thieves. We’ve chosen a select group of people to live here and we want to fit into the neighborhood as much as possible. This means that we want to avoid creating nuisances such as trash and noise problems. 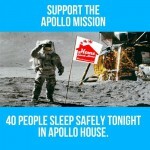 More importantly, we’d like to give the building a presentable appearance and finally, to restore its monumental value. We, the living group of Wijde Heisteeg 7 are facing the court case against our evection. This is a call out for everybody to come and show support on the 8th December at 09:30 at Parnassusweg, for the court case of Wijde Heisteeg 7 against the state. The O.M. decided that we should leave the house, for the very important reason of putting antikraak inside. We kind of disagree with this idea of being on the street just because, so we will go to court. If you want we can meet at 08:45 at Wijde Heisteeg 7 Amsterdam, to go together. 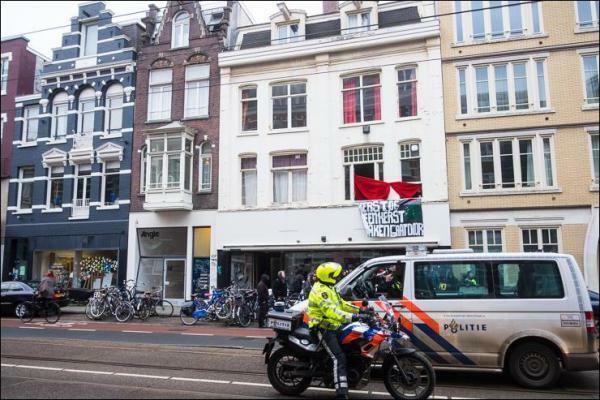 Update 25/12/2016 – Eviction Wijde Heeisteg 7 – On Friday 23rd December, less than 16h after the negative verdict for WH7 the cops and construction worker show up at 8 am and evict the house with the inhabitants and their animals inside. 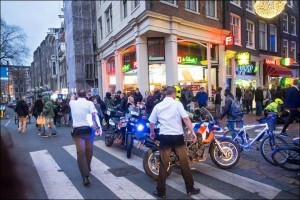 Everyone gets arrested and the dog and cat were put also in the police van and transport to Marnixstraat main police station. the animals could go from police station free after one hour. The 4 arrested were kept in custody for squatting until 10.30 at night. 3 of them were released . The last one because unpaid fines was sent to Zuidoost cellencomplex and then to different prisons in center Holland. Today midday that person also get released, so right now everyone is free. 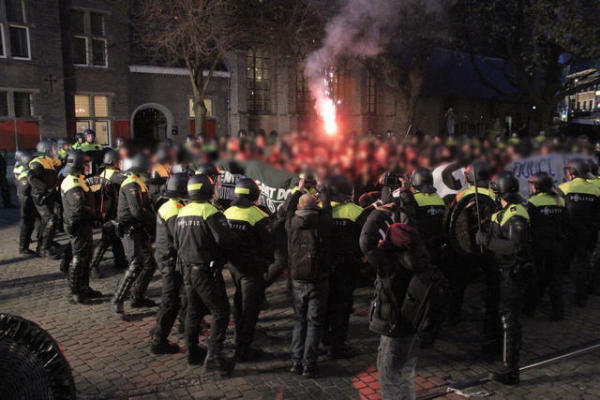 Saturday the 19th of November a demonstration should have taken place at the Kerkplein in The Hague against the repression of anarchists and anti-fascists in The Hague and elsewhere. 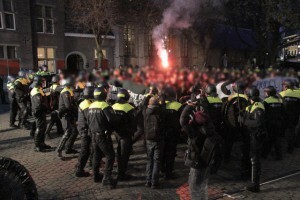 On the order of Hague mayor Jozias van Aartsen the police made the demo impossible through repression and violence. The demonstration ended in a kettle and the violent mass arrest of 166 people. In our opinion this is completely unjustified. That’s why we have started to collect complaints about the actions of the police, which we want to submit collectively. 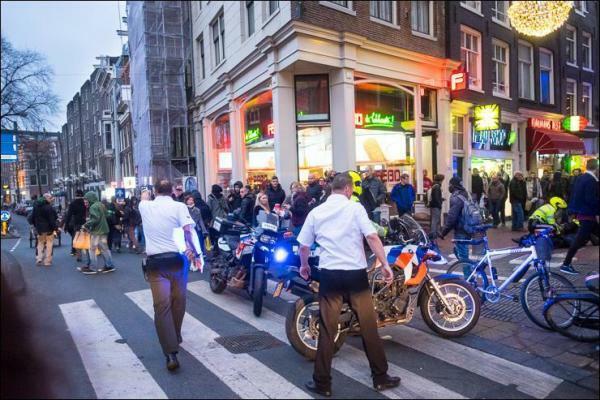 If you were arrested, or were mistreated by the police in any other way, fill in the attached form and mail it to arrestantengroep070 [at] riseup [dot] net. Did you not reveal your identity during your arrest? Then you can still file a complaint. In that case you can skip the personal questions, but fill in a made up name so we can easily distinguish the anonymous complaints. It is also possible to send the complaint via PGP. Send us a message with your PGP key and we will send you ours.